The Spring Everest Expedition season is already underway and more climbing teams are on the mountain than any previous year. Chris Larsen and Mark Savoff are going to do the classic trek to Everest Base Camp along with the Berg Adventures team, Ang Temba, Jyeta and the others. 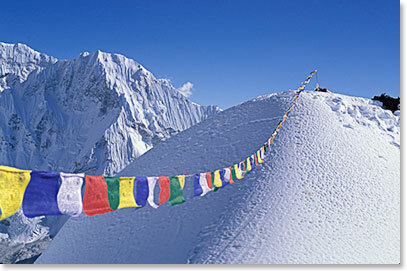 They will meet many friends along the way in the villages and monasteries of the Khumbu Region, homeland of the Sherpas. After climbing Kala Pattar and visiting Everest Base Camp, the guys will set their sights to the stunning glaciated Island Peak at 20,305ft/6190m. Follow them on our daily dispatches of their 29 day journey. April 23, 2017 – We Made it to Pangboche! April 18, 2017 – Exploring Kathmandu! April 17, 2017 – Namaste from Kathmandu!